The Code is reviewed continuously and is normally updated annually. The 2012/13 Code has been developed by the CIPFA/LASAAC Local Authority Code Board and has effect for financial years commencing on or after 1 April 2012. Following a consultation in August and September 2012 on the 2012/13 Code Update and the 2013/14 Code, CIPFA/LASAAC has issued the 2012/13 Code Update (which may be accessed below). 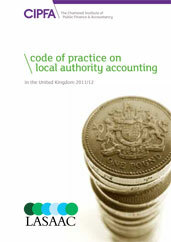 The Update to the 2012/13 Code of Practice on Local Authority Accounting in the United Kingdom (the Code) is the second mid-year update to the Code. Like the 2012/13 Code, this Update (the 2012/13 Code Update) applies for accounting periods commencing on or after 1 April 2012. The 2012/13 Code Update must be read in conjunction with the 2012/13 Code published by CIPFA in February 2012. The tracked changes to appropriate extracts of the 2012/13 Code include both new and amended paragraphs to form the 2012/13 Code Update. Download the CIPFA/LASAAC Constitution for the Board’s terms of reference The Financial Reporting Advisory Board (FRAB), and the Memorandum of Understanding between FRAB bodies can be found on the HM Treasury’s website.